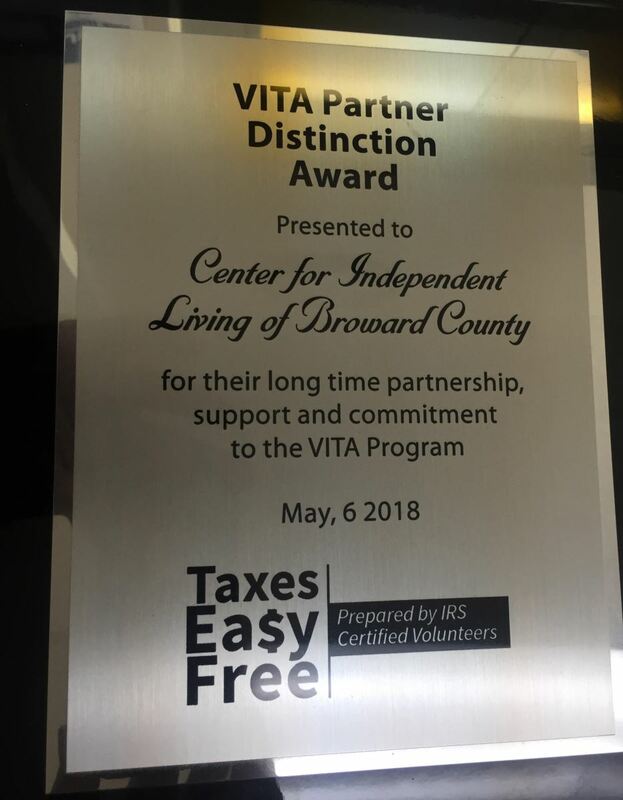 The Center for Independent Living of Broward is proud to receive the 2018 VITA Distinction Award. The award is given annually to an agency for its longtime partnership, support, and commitment to the Volunteer Income Tax Assistance (VITA) program. We were one of several agencies honored on May 6 during a ceremony at Tradewinds Park in Coconut Creek, Florida. The VITA program was able to bring back $85,000+ into the pockets of families in the community. The Center for Independent Living of Broward has partnered with Hispanic Unity for over 5 years as a VITA site. Between February and April 2018, we assisted over 90 individuals and families file their 2017 income tax returns. In addition to tax preparation, we provide disability etiquette training to ensure that VITA tax preparers interact appropriately with individuals with disabilities, essential for total inclusion through any VITA site.